Winter round up 2014 - Overland Track here we come! You are here: Home / Overland Track / Winter round up 2014 – Overland Track here we come! 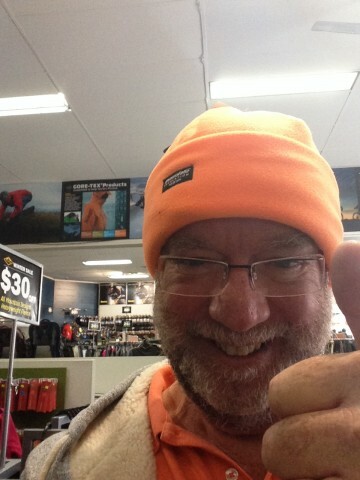 Winter round up 2014 – Overland Track here we come! Lots of things have been happening around the Our Hiking Blog household. After moving into our new home about 12 months ago the dust is finally settling. This weekend the garden went in and NEXT weekend we finally head off for a long awaited winter trip on the Overland Track in Tasmania. Heading from north to south, allowing six nights we are taking our middle daughter Hannah on her first Tassie hike. 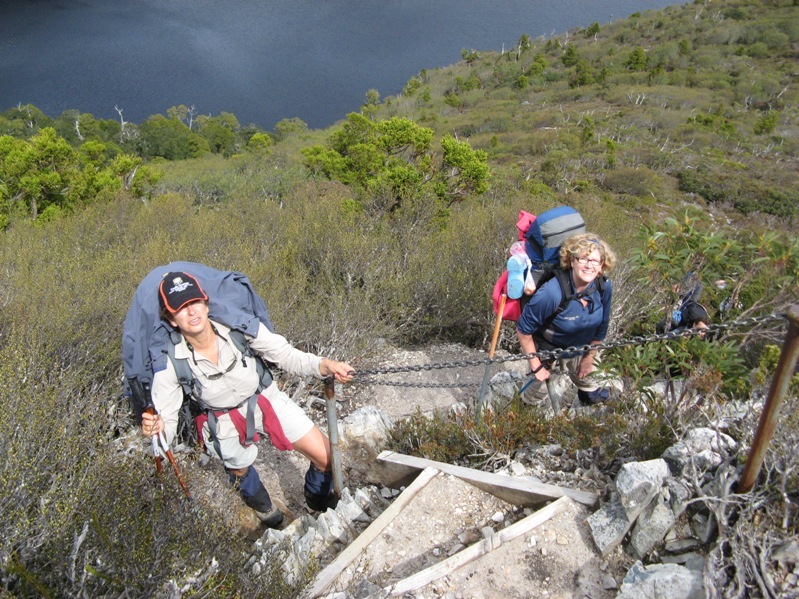 She had a bit of experience hiking a few years back with Wollongarra, completing a section of the Australian Alps Walking Track. She is the last of our three children to walk the Overland. It has been almost 3 years since we set out on a trip in Tasmania in Winter. That is far too long. This video and article will remind you of our trip into the Western Arthur’s in Tasmania’s south west. Great trip, in retrospect…..
We have updated a fair bit of gear for this trip. We are trying to reduce our pack weight. While age is being kind to us so far, carrying 20+ kg is not fun. We were also blessed with our first grandchild, Elliot Thomas three months ago. What a fantastic addition to our family and he has already been on his first camping trip. Clare and Jay are both outdoors people and Clare has a terrific site called, well, The Life of Clare! Here is the article about camping with the Reilly’s. We recently updated the look and feel of Our Hiking Blog. It is now mobile, tablet as well as web enhanced. We hope it is a much easier reading experience for the thousands of people who read our information on their phone or iPad. It may interest you that 40% of people who visit our site do so on a portable device. Who said a phone is just a phone! Over at Facebook there has been a lot of action on the Our Hiking Blog page – please join us there and like the page. We share interesting stuff from across the hiking world, post fun things we find around the globe and have great chats with our readers. It is also a place where you can share your trips or ask questions of our 600 plus followers. Google+ is another great way to connect. We find it a very visual medium and follow some fantastic outdoor people from across the world. The quality of many of the photographs are stunning. Check us out on Google + here. 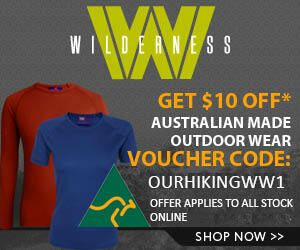 Finally, for you Tweeps, we love Twitter and hang around there sharing great stuff from the outdoor world. With over 2000 followers there is always something happening. Check out Our Hiking Blog on Twitter, it’s amazing what you can learn in 160 characters! Good luck on your trip guys! Looking forward to the report upon your return. I believe our daughter Hannah has volunteered to write up the trip report this time from the perspective of a first timer. Can’t wait to read what she thinks of it! It’s really great to see you back at it Frank. Interestingly your blog name came up while hiking part of the East Coast Trail last weekend in Newfoundland. Does the name Narcissus ring a bell? He’s a great fellow and often a trip leader. It made the world feel very small. Narcissus certainly does ring a bell. The famous final hut on the Overland Track. Not many people stay there as they are always keen to get out into civilization! The world is small, check out Jessica’s comments. They leave on the Overland Track the same day as us! Hi, I hiked the overland last July and had a blast, rain then masses of snow. It is beautiful and challenging. Glad you had a great time, we will! Given the strange coincidence that I’ll also be hiking the Overland at the same time, I’d love to see what you think about the Aarn packs. I have a few friends that use them, and one day I might upgrade to one, so it’d be good to hear another opinion on them. Yes, a strange ‘online” coincidence indeed Jessica. Just playing around with the packs now and trying to work out how they “work”. Hopefully we will have it sorted before you jog past us! oh, Clare the daughter who is unfortunately not joining us this time has one, she loves her Aarn pack and reviewed it over here: http://ourhikingblog.com.au/2014/03/aarn-backpack-review.html . The other weird coincidence was the pack she is pictured using is her old and much loved Mountain Designs one. It went on many trips with her….. Brilliant! My MD pack has lasted a decade, including abuse from scrub-bashing in Scouts, crossing glacial rivers in Patagonia and sleet in south-west Tasmania, and it is with a heavy heart that I am upgrading. Your daughter writes well, and has picked up on the most important point: you don’t really know whether a pack works for you until you try it, for better or for worse. Doubt we’ll be doing much jogging – my parents potter along enjoying the scenery, and I’ll be playing with my new time lapse toy, so it’ll be slow and steady for us! I’m a avid follower of your blog. I still haven’t done the overland track yet but have been on a number of short trips. I’ve noticed you have all kitted out with Aarn bodypacks. I would really like to read about your experience with them on this trip. Can’t wait to read your report when you all get back! Someone should alert the authorities that Frank and his party are missing – nothing has been heard of him since the 26th of June; 10 days ago and he was only going for 6 nights! Shouldn’t be hard to spot wearing that hat! We are back, arrived in Hobart on Sunday and home last night. It was a great trip, started with snow and ended with sunshine. Give us a couple of days and we will wack up a trip report.. There are some pics over at our Facebook page: https://www.facebook.com/OurHikingBlog . Enjoy!